Sixteen-year-old Nia believes that she is merely an orphan girl - until she performs elemental magic that has been lost to society for centuries. After a mysterious figure breaks into an ancient tomb on the search for the Adradhar, four magical and powerful crystals given to mankind by the spirits of earth, water, air, and fire centuries ago, Nia is soon swept into a dangerous run against time. Now her choices could save - or destroy - the Empire. The shadow jumped at the sound and almost fell back down the narrow stairs of molding wood. He took a deep breath, trying to calm his mind, and wiped away the sweat from his forehead. Slowly he continued up the stairs, cautious to not make another sound. Out of the darkness in front of him appeared a tall wooden door in the approaching light of his torch. Strange circular markings were skillfully carved in its dark wood that almost looked like dancing snakes in the flickering light. He grabbed the iron door knob and hesitated for a moment. Then, taking a deep breath, he opened the door and stepped into the ancient chamber. The warm stuffy air hit his face and he wrinkled his nose at the mildewed stench that hung in the air. The circular room was empty except for two dusty, faded tapestries that hung on the otherwise bare stone walls. A round stone basin stood tall between two pillars in its center. His breathing fastened as he walked towards it, and his unsure steps echoed loudly from the stone walls. Instinctively, his right hand grabbed for the necklace he was wearing under his black rope. Then, stopping in front of the basin, he reached out his hands and said hissing: "Safraz ith pressai!" A blue flame suddenly appeared dancing in the basin, growing taller and hotter with every second. The man took a step back, but kept his hands steady and raised. "By the fires of old, I call upon thee, oh great Bassoar!" The small fire bristled and cracked and suddenly burst into tall yellow and orange flames that were licking dangerously at the ceiling. A blazing heat engulfed the room, and the man had to shield his eyes from the sudden brightness. "So you have finally decided to come back?," a cold, deep voice echoed through the stone chamber. "Too late, don't you think?" "No!" cried the man in sudden shock and fell on his knees. "Please, my lord, let me explain!" The deep voice laughed. "I wonder what I am to think of the incident with Cynbel? You know I don't like mistakes... and I don't forget!" "I-I can explain!" the servant stammered again. "His son was there! A-And I think he saw me, so I had to...."
"You were TOLD to bring him to ME!" the voice roared out of the fire. The kneeling man broke, shivering. "NO! Please master, I-I'll do anything! If you would just give me another chance, I-I'll show you my worth and... and my everlasting loyalty!" It went quiet for a while, and the silence was only interrupted by his sobs and the bristling and cracking of the blazing fire. Then, the menacing voice laughed fizzling. "Of course you will, my loyal servant. And I have just the right mission for you." The man looked up in astonishment, not believing his ears. "Oh master! Thank you! I...."
"But let me warn you, this is your last chance! You know what I'll do with those that are of no use to me!" The man swallowed and nodded. "Listen closely now! Come nightfall, you will enter Righ Ranagh! I can sense one of Adradhar there. Bring it to me! It is time!" The kneeling man's eyes grew wide in awe and terror. He stood up from the floor and bowed deeply. "Yes, master!" he said with a surprisingly firm voice. He turned on his heels and left the ancient chamber to return to the castle. Finally got around to reading and I have to say that I am so happy I did, chapter one is amazing! There are a few spelling issues but with this being in draft form that is to be expected, otherwise it is absolutely captivating! I look forward to reading more!! Oslas had always been a busy city, but especially now, at the height of summer, it was bursting with excitement. The masses were clad in colorful robes and were all headed into the same direction: towards the great market of Oslas. It was already past midday when Nia, an orphan of sixteen years, and her wildcat Ky finally passed through the cities imposing stone arches. The afternoon heat was stifling in the stony ruins of the ancient capital, and a strange smell of spices and sweat hung in the air. Nia tucked her long, brown hair behind her ears, grabbed the heavy sack tighter that she was carrying over her shoulder, and hurried past the crowd, slowly cleaving her way through the narrow and crowded passageways towards the center of the city. She could tell it would be a busy day, and she fastened her pace knowing that she would have to make haste if she didn't want to miss this opportunity to sell her stolen goods. It wasn't long until she reached the market and a big smile appeared on her face. People of all ages had filled the grand plaza and were talking to each other with excited voices, and hundreds of colorful tents and market stalls were arranged in the fashion of a giant circle that lead around the plaza. It had been a while since Nia had last seen such a crowd. The air was pierced by the shouts of merchants proclaiming the excellency of their unique goods as she squeezed past the stream of people. Reaching her usual spot between two crumbling pillars of stone, Nia was happy to finally put down her bulky sack. "Whew!" she exclaimed excitedly. "I have a good feeling about today! If we sell some of this stuff, I'll buy us some warm food! I'd love some nice stew tonight. And so would you, right Ky?" She knelt down and scratched her loyal friend behind the ears. Ky purred and blinked her big trusty black eyes. "Talking to that beast again, huh?" said a most unwelcome voice behind her. Nia would have recognized that voice anywhere. Ughbel Tolk was a well known merchant in Oslas, famous for his riches, his sly ways of getting what he wanted, and a big fat wart that sat right above his left eyebrow. He had a habit of inspecting her goods whenever she was in town, but he had never actually bought anything. Nia suspected that he only came to her to make fun of her. "I guess that happens when you grow up all alone in the wilderness without a family or friends," Ughbel continued with an ugly smile, revealing his yellow teeth. Greasy black hair was sticking to the sides of his round head. He was short and large so that the long purple robe he was wearing had trouble hiding his round beer belly. "I expect it's just a matter of time until you go mad and start talking to trees and stones and whatnot!" Nia clenched her fists. "As if you would know what it's like to live out there!" she snarled through her teeth. Ughbel smiled, seemingly happy to have angered her. "Now then, let's see what you've got in your dirty little sack there, shall we?" She bit her lip. She had no other choice as to do as told as long as there was still a slight chance that Ughbel would buy something from her; she desperately needed the money. Swallowing her anger, Nia emptied the contents of her sack onto the stony ground and out poured the ancient artifacts that she had collected this morning in the ruins of Righ Ranagh. There lay a couple of carved statues depicting the spirits of the earth with their rough tree-like features, some beautifully adorned pottery, a couple of metal shimmering plates and chalices, and a wooden box engraved with ancient text and images. Nia thought she saw his smile fade for a second. He quickly looked away, reached into one of the inner pockets of his oversized purple robe and pulled out a monocle. "Well, well, let's see what we got here!" he muttered with a mocking undertone. He grabbed the wooden box with his fleshy fingers and started examining it. A couple of minutes must have passed until he finally gazed back at her. The smile had vanished and his eyes beamed with sudden excitement. "Where did you get this girl?" "I... I bought it from a craftsman," Nia lied quickly, hoping it would sound somewhat convincing. His eyes narrowed. "Don't lie to me, you little fool!" he snarled. "I know tormodrian relics when I see them, and these are definitely tormodrian. You've gone to the forbidden resting place of the old kings, have you not?" Nia was taken aback. Trying to keep a straight face, she quickly considered her options. If she would admit that she had gotten the relics from Righ Ranagh, the tomb of the ancient kings, he might send the guards after her. On the other hand, if she would stand by her lie, Ughbel would probably know, being the experienced merchant that he was. And, on top of that, she knew that she was a pretty bad liar.… Nia decided to tell the truth. If Ughbel were to send the guards after her, she could probably outsmart them and escape, as she had often done so in the past. Nia finally nodded, affirming his conclusion. "Ha!" he cried out triumphantly. "Righ Ranagh! That is interesting... very interesting!" His eyebrows narrowed as he was thinking, moving the ugly wart. Then his lips curled to an sleeky smile. "Today must be your lucky day, skinny girl. I'll give you one stora for all of it!" "What?" Nia didn't know what she was more surprised by: The fact that Ughbel didn't want to sell her off to the guards, but instead actually wanted to buy something, no, all of her goods from her; or the fact that he only offered her one stora for it. Sensing her chance for a better deal, she took a deep breath and said with as much confidence as possible, "You and I both know that this is worth much more than you want to admit. Give me five storas and five muths, and these relics are yours!" His eyes glistened. "Four storas and five muths!" "Deal!" Nia reached out her hand, and Ughbel took it. A couple of minutes later Nia found herself staring in disbelief at the four big silver and five bronze coins lying in her hand. "Can you believe this, Ky?" she mumbled to the wildcat. Ky huddled against her legs. "I don't think we've ever had this much money before! Well, I know what we're having for dinner tonight! Today really must be our lucky day!" she laughed. Nia spent the next hour strolling through the dense market. Squeezing her small body through the crowd, she enjoyed examining the diverse goods offered. On white and blue cloth, vendors had displayed fine jewelry of gold, silver, and precious stones that shimmered brilliantly in the sunlight. There were colorful adorned garments made by the embroiders of the queen, woven baskets of straw and wood, and plenty of fresh fruit and vegetables that the farmers had brought into town early in the morning. She bought some juicy apples and freshly baked bread as provision for the next day before heading to the southern part of Oslas, where the many taverns and alehouses always welcomed weary travelers. The sun was already setting when she came satisfied out of the pub that offered the most delicious mushroom and beef stew in town. She had even been able to get some warm meat for Ky. Navigating the ancient streets of the city, she worked her way back to the main street with its stone pillars that stood tall on either side of the road. They were one of the few monuments of the early ages that hadn't completely fallen to ruin, although some of the pillars lay tumbled over near the stone walls. The street in front of her lay empty and quiet in the growing darkness; The market was over by now, the vendors had packed up and left and the people that had crowded the streets had almost magically disappeared. The only thing she could hear were the distant shouts of some drunkards. "There you are!" called a honeyed voice. Nia winced at the unexpected sound and whirled around. It was Lugh, a young man her age, with short blond hair and a strong built. He had laid his eyes on her and had been pursuing her for the past year. Nia had told him multiple times that she was not interested in him, but he didn't want to hear that. Lugh had appeared out of the shadows of alleyway and was now standing in front of her, closely followed by the two guys who apparently always went wherever Lugh went. Nia didn't even know there names. Lugh grinned down at her, his blond hair blowing in the evening breeze. "I've been looking all over town for you, darling!" "I'm... I'm flattered Lugh," Nia said hesitantly, looking nervously around for a way to escape. "But I've told you before that you don't have to look for me anymore!" His eyes narrowed. He took a couple of steps towards her as she walked backwards, and Nia hit the wall. She was surrounded. "Why is it that I can get every girl in town, except for you?" he said with growing anger. "What makes you think that you are so special? You are a nobody, and you'll always be a nobody, you hear me?" His usual sweet voice was now loud and cold. Nia had never seen him act like this before. His hand hit the cold stone hard next to her head, pinning her against the wall. Nia's eyes grew wide with fear. What is he doing? "I CAN’T WAIT FOR YOU ANYMORE, D’YOU UNDERSTAND?" he yelled. Then he violently grabbed her arms and leaned down to kiss her. Nia screamed and struggled against him, kicking her legs, but he was too strong. Ky growled. "AAARGH! DAMN BEAST!" Lugh screamed suddenly and let go of her for a brief moment. Ky had bitten Lugh in his leg and was still not letting go, giving Nia enough time to wriggle herself free of his grasp. Now Lugh's two friends stepped closer, blocking her escape ready to hold her back. "What is going on here!" demanded a voice loudly. They all froze and looked around for the source of the voice. A dozen guards where standing right behind them, wearing full mail and armor and carrying bright torches and flags of white and blue. Each of them had a blue cape hanging from their shoulders: The cape of the Royal Guard. A rider on a white horse emerged from the shadows of the dark street. He had a thin fair face and long blond hair that was tied at the back of his neck. His rich raiment of blue and white was adorned with golden trimming and told Nia that he must be of some kind of importance. Maybe the City Guard finally had gotten rid of their corrupt and ruthless commander, she thought. A second rider emerged from the dark on a black horse and stopped next to the first. He had a grim look on his face, his black hair was falling just past his shoulders, blending with his black garment. Nia couldn't recall to have ever seen any of them before. "P-Prince Lir!" exclaimed Lugh, sinking onto his knees. "We... we were just playing games! And-and then this beast attacked me for no reason! Tell him boys!" He hastily looked to his friends for help, but the two boys were shocked by the sudden appearance of the prince and his guards and looked trapped. Their eyes were moving quickly to the narrow alleys to either side of them. Petrified, Nia was still standing a couple of feet away from Lugh. She couldn't move and stared in disbelief at the blond rider. The prince? When the boys didn't answer, Prince Lir seemed to grow impatient. "Playing games?" he asked coldly. His eyes were piercing Lugh, then they wandered to Nia, and for a split second she thought she saw sadness flicker through them, but then they were the same cold, piercing eyes again. "Can you affirm that, my lady?" he asked. Nia blinked and abruptly came back to her senses. "N-no... m-my lord! This man," she stammered, pointing at Lugh,"...he was hurting me! And Ky... my cat, she was only trying to protect me!" Her voice broke and tears were rolling down her cheeks. She couldn't help it; the shock was too deep. Prince Lir nodded gravely. "That is also what I saw," he proclaimed, and Lugh's eyes grew wide with fear. "Guards, take these three to the City Guard! They seem to be a threat to the good people of Oslas." Nia watched bewildered how the guards seized Lugh and his two friends and led them away. Lugh's head was hanging low. He didn't resist. Prince Lir had gotten off his horse and was now walking towards her. "I'm sorry, my lady! I hope you are unharmed?" His voice was a lot softer now. He stopped in front of her and Nia looked up at him, still agitated. Tears were glistening on her cheeks in the light of the flickering torches. "If there's anything I can do, please let me know!" His gray-blue eyes were looking at her with the same deep sadness again. So she hadn't imagined it. She couldn't withstand his studying gaze and averted her face. "I think I'm fine, thank you for... for your help... m-my lord!" she mumbled nervously. She heard the Prince sigh and looked back up. "If you change your mind, you know where to find me!" He inclined his head at her, turned around and mounted his horse gracefully. After exchanging a couple of words with the other rider, he raised his arm, shouted a command, and then they rode away, leaving Nia and Ky alone in the dark. Nia sank to the ground. Ky mewed and cuddled up to her. "Thank you Ky!" she said petting her. A million thoughts rushed through her head. Why did Lugh do this? Did a member of the royal family really just save her? And were Prince Lir's intentions true? Or was it just a show he put on to turn the peoples' lousy opinion of the royal's leadership around? Whatever his intentions were, he did save her. But this would not change her opinion of the royals, she stubbornly told herself. It was true that she had never met a royal before, but after everything that was going on in this land, how could she not blame them? The guards and every official she had ever met were corrupt to the bone, there was less and less food to eat every year, and herself and everyone else in this damned land were living in centuries old ruins, while the royal family enjoyed their lives in that grand castle with its flying towers! It's actually quite sad, she thought. They must have once been a flourishing civilization with great magical powers. She could see the signs everywhere. The gigantic palaces, fortresses and cities her forefathers had built were made from heavy pieces of stone that were three times her size, and some of these fortresses were still floating high up in the air! 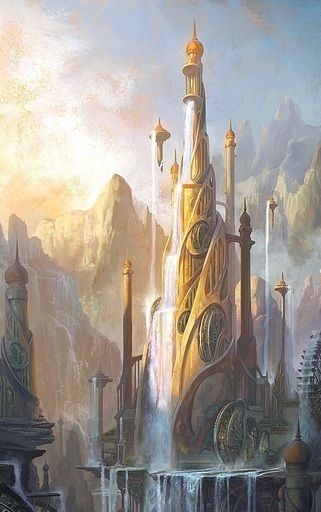 She had often looked at the flying towers of the royal palace of Dun Anam herself, with their rushing waterfalls falling from the sky. But even though it was one of the most beautiful things she had ever seen, it made her sad; it reminded her that the key to its magic was lost to them forever! Nia got up. She had already spent too much time in this cold and dark corner of the street. "Let's go back, Ky!" she said to her trusty friend. She knew the city well, and the tricky, winding main street wasn't a problem to her in the darkness of the night. They quickly reached the northern gates of Oslas and followed the path that led out onto the fields. Out here, the wind was blowing quite strong, making the silver grass look like it was dancing in the moonlight. Nia shivered and, pulling the cord around her gray robe tighter, she quickened her pace. Instead of following the path over the three bridges to the palace, she went westward and straight towards the mountains, where Righ Ranagh, the forbidden tomb of the ancient kings, lay hidden. It's entrance was a small opening in the mountainside that she had found by accident just a couple of days ago. It had been her biggest find yet. Ky jumped swiftly over the first rocks and vanished into the dark cave. Nia followed her slowly. The stone was wet and treacherous, and she could never know when a rock would give in under her feet or would abruptly end, revealing an abyss. When she first had went in to explore the cave after finding it, she had been worried to loose her way in the massive treacherous labyrinth and the everlasting darkness, but to her surprise she found, a little ways in, some stone pillars topped with large basins on which hot tall fires danced. These columns were neatly placed one after another some distance apart, leading the way straight to the tombs. At first she was certain that someone else was in the cave, but even after days of exploring grottoes, temples with giant statues of the kings carved into the stone, and ruins half sunken into black and icy cold lakes that had formed over the centuries, she couldn't find any signs of life, and still the fires kept burning. The more she thought about it, the more she was certain that it was ancient fire magic. Even though she could smell the smoke, it somehow magically disappeared and didn't cause her to cough, or her eyes to tear. She quickly reached the first fire pillar that marked the way to the ancient tombs. The descend into the cave was strenuous, and her hands soon started to ache from climbing down the splintering rocks, but Nia kept going. She wanted to reach the Temple of Seoras, in whose proximity she had built her camp, as soon as possible. She needed a good night's sleep and all her strength if she wanted to explore more of the cave tomorrow to hopefully find more valuable artifacts to sell. Lugh's words came back to her. 'You're a nobody, and you'll always be a nobody!' It really bugged her, and made her even more determined to find as many valuable relics as possible in this cave. This could be her way to a new start; a new life with a warm home, far away from her dark past and plundering ruins. Nia turned around the next corner and stopped abruptly. Something was wrong. She could see the towering facade of the Temple of Seoras illuminated by the fire pillars at the end of this cavern chamber - and there were voices. She immediately hid behind the nearest rock. Ky made a growling sound. "We have to keep quiet, Ky!" Nia whispered. "Let's try to get to our camp and see what's going on." Ky stared at her, then turned around and went into the direction of their camp. There had always been a special connection between her and the wildcat, starting from the day she had first found her as a kitten. There was so much wisdom behind Ky's eyes, and Nia was convinced that she understood every single word she had ever told her. Nia followed her quietly. The voices grew louder. She carefully climbed over the last rock and stopped abruptly: someone had searched her camp. The few possessions she had, a couple of fur blankets, a green robe, an iron cauldron, and a bronze cup, lay sprawled across the ground near the open fireplace. Nia became anxious. Whoever was in this cave knew that she would be coming back here. And they might even be waiting for her right now, ready to savage her at any second. She peeked over the nearest rock towards the temple's terrace. There were two figures standing opposite of each other. One was cloaked in black, wearing a big hood drawn deep over the face, making it impossible to make out any features, the other, a young man, was wearing black garment and had black hair that fell down onto his shoulders. Thieves or mercenaries! she thought at once, and listened. Her eyes widened. Adradhar! The magical crystals of the old kingdom! Are these men looking for the Adradhar? She needed to hear more. Carefully, she sneaked up just close enough so that she could hear them loud and clear, hiding behind a big rock with Ky by her side. "... have been waiting too long for this moment!" the cloaked figure said with a cold voice. "Look around you! Our glorious days lie in our past! But now the power of the old kings will soon return, ... and not even you can stop me!" "We'll see how far you get!" the other man shouted and drew his sword. Nia watched in terror as the two men started to circle each other. Then, steel clashed upon steel, and the sound echoed loudly from the dark walls of the cave. The young man seemed to be stronger then the cloaked figure, but much less experienced. He charged often, throwing his whole weight forward, but the cloaked man dodged his blows with ease. Nia covered her mouth in shock. A deep cut had appeared on the young knight’s right shoulder. "So disappointing!" the other man said, looming above him. "I had expected more from a royal of your status! But then, your father didn't put up a good fight either!" he added. The young man lunged at him with surprising strength and a fire burning in his eyes. He swung his sword wildly left and right, but the cloaked man was fast and countered each strike. And then the knight screamed again. A fatal blow had hit him right between his ribs. He fell onto the floor, breathing heavily. "You should consider yourself lucky to have made it this far! Don't think I didn't see you that night! I would've killed you right there, but it was too risky. So I had them feed you some lies, and you ran right into my net!" He laughed. "Time to say goodbye, Dwyn!" He raised his arm for the final blow. "STOP!" Nia cried out and ran out of her hiding place. She regretted it right away. She had no plan, but she couldn't just watch this murder either and see the man get away with the Adradhar. The cloaked man halted in mid air and took surprised a couple of steps back. When he saw her thin figure and a wildcat standing there next to the dying man, he laughed. "A girl and a cat?" he said amused. "Seems like you've got yourself a little friend here trying to save you." The bleeding man stared up at her in surprise, and Nia suddenly recognized him. His black her was sticking wildly to his face and there was blood running from his mouth that was smeared across his face. Still, there was no mistaking. It was the other rider from the dark streets of Oslas she had seen earlier. "Unfortunately I have no time for your heroic games! No! It's time to turn history around! Watch in awe, and die!" He raised his hand, revealing a small blue stone. It started to glow brightly, so bright that she had to shield her eyes from it. The light gathered above them like a miniature sun, illuminating the whole cave into blazing blue light, and then, without a warning, it shot straight down at Nia, hitting her in the chest. The force knocked her off her feet. She flew backwards and hit her head hard on a rock. Then everything turned into darkness. When Nia woke up, her head was pounding. "Argh!" she mumbled dizzily and touched the back of her head where it had hit the stone. Something warm moved beside her. She hugged her cat tightly, and then she remembered: The cloaked figure, the dying knight, and the crystal that had struck her. She got up as quickly as her aching body allowed and cautiously searched the dim cave. The cloaked man had disappeared, but the young knight was still lying on the stony ground not far away in a puddle of his own blood. It looked almost orange in the flickering light of the pillars of fire. "Oh no!" Nia feared the worst. She walked over to his body, knelt down next to him and turned him onto his back. He groaned and coughed up some blood. "You're alive!" she said startled. "And... and so are you!" he breathed, having difficulties to speak. He was pale and didn't look good at all. "Psh! Don't talk! You'll kill yourself!" He managed a vague smile, and then coughed up some more blood. "We have to stop your bleeding!" She tore off a big piece of cloth from her robe. His black tunic was soaked with blood, and when she lifted it, she saw a big flesh wound on the right side of his rib cage. There was blood everywhere. Nia grabbed the cloth tightly and pressed it onto the wound. He cried out in pain, arching his back. "I'm sorry, but you have to hold still!" she said, trying to make her voice sound as calm as possible. Then something caught her eye. Her fingertips where glowing lightly where they touched the skin of his chest. She quickly lifted her hands and stared at her fingers, but the glowing had stopped. The fall must have affected her more than she initially had thought. Shaking her head, she pressed her hands back onto the cloth. And there it was again, a faint glow emitting from wherever her hands touched his skin. A welcome warmth drifted through her fingers into his body. She removed her hands and gasped. The wound was gone. Disbelieving and confused, she stared at her hands again that were now covered in his blood. "What have you done?" The young man had lifted his head and gazed down onto his healed chest. "I... I don't know!" she said honestly. "All of the sudden there was light coming from my fingers!" It sounded crazy. He looked at her with a strange mix of confusion and anger. "How... are you feeling?" she asked as she turned her concentration on the deep cut in his shoulder. "I don't want you to help me!" he said angry through his teeth. "Just hold still for a second!" She tried to put her hands on his wound, but the young man winced and moved away from her. "Ouch! Stop it!" He stood up. "I'm just trying to help! And you shouldn't be walking around just yet!" "I'm fine!" he said annoyed. "We have to get back to the palace. I know a way in where we hopefully won't draw too much attention at this hour." Nia was still occupied thinking about her sudden healing powers, and it took her a second to understand what he had said. "Wait a second!" she said baffled. "You want me to go to the palace?" "Yes!" He sighed. "Listen, we don't have much time! That man..." His face grew grim. He took a deep breath and started over. "That man has one of the Adradhar. And it is just a question of time before he starts to use it... again!" He looked her over. "I don't know what happened back there, but if you like it or not, you are involved in this now, and we have to talk to Lir as fast as possible!" Nia nodded. "Alright, I'll go with you. But only if you ask me nicely!" He laughed sarcastically, then his face grew grim again. "Let's go!" He turned around and walked away. "Is that how you treat someone who just saved your life?" "Pf! Can you believe this Ky?" Ky's eyes looked at her with sympathy. He had already vanished from sight when Nia began to follow him reluctantly. They quickly climbed their way back up to the caves entrance. Nia had thought that his shoulder would be hurting him, but he was able to climb and jump from rock to rock without showing any sign of pain. They finally reached the cave's entrance, climbed back out into the dark night and found themselves standing at the bottom of the mountain. Fields of grass stretched out in front of them in the darkness of the night, some faint lights in the distance revealed where the city of Oslas lay. Nia shivered. The breeze was still strong and cold out there. "Hurry up, will you?" He stood impatiently on the nearest hill, his eyes scanning the fields, waiting for her. "I'm right here!" she said. His tone increasingly started to bother her. "Do you see the mountain right there next to the castle?" He pointed to a mountain that was ascending at the eastern castle walls. "We are going to the castle," he interrupted her bluntly, "but we have to take a different route first. I don't want anyone to see us, and this may be the only way!" Nia didn't like it at all that he wasn't explaining his plan to her, but judging his current mood, she felt that any questions would just annoy him, so she kept silent. They marched on, first over grassy fields and hills, then up into the rocky mountain. Nia was doing fine at first, but then her back started to hurt and she got very tired. No wonder, I haven't gotten a chance to sleep all night, unless I count that moment when I was unconscious..., she thought wearily. "How long do we still have to go?" she asked out of breath as she climbed over a cold rock with a wider surface. The stars had already vanished and the break of dawn was close. She had somehow lost her balance and had run into him, and was now sitting at his feet. He looked down at her, and rolled his eyes. "What? But we're standing on a mountain!" she said briskly, waving her arms through the air. "Just listen for a second, OK?" He took a deep breath to calm himself. "This rock you just so elegantly fell over is our shortcut into the palace. Some ancient air magic was worked on it, and it flies directly up to the second tower if you step on it. Lir and I discovered it when we were young," he added. "We think it might have been an ancient escape route." Nia's mouth opened and then closed again. Is he joking? "You want me to step on this rock and fly over to the castle?" "You are scared!" He sounded amused. "Well... this is going to be fun then!" He grabbed her by the arm, stepped on the rock and pulled her up behind him. "Argh! Let go! You're hurting me!" She shook him off and Ky jumped to her side, ready to defend her. Suddenly, the rock started moving and lifted them up into the sky. Nia almost lost her balance and hastily grabbed the nearest thing she could reach: his arm. When she realized that, the blood started rushing to her face, but she dared not to let go. He smiled down at her, standing tall and proud, enjoying every second of her despair and defeat. The rock had gained a promising height and was now soaring high above the valley's rivers and fields towards the castle that lay nestled at the feet of the mountain range. Nia felt sick to her stomach. She had never been fond of heights. She closed her eyes, but she could still feel the strong and cold breeze on her face. "Time to wake up!" his voice said after what seemed to have been an eternity. Nia opened her eyes and saw a floating tower quickly approaching. It's white walls were shimmering in the light of dawn, and there was a waterfall coming out of one of its lower windows plunging down into the valley. On the other side, she could see a suspension bridge that consisted of only floating rocks and rope and connected the hovering tower to the castle. They reached an open terrace and the three of them jumped onto the flying tower. Nia took a deep breath. "The prince lives here?" She followed him hesitantly, but curious, through a white door and entered into the most beautiful circular room she had ever seen. There was a giant canopy bed with red drape around it hanging all the way to the wooden floor. Multiple bookshelves full of stacked leather books and scrolls were standing next to a study corner with a big wooden table and a couple of beautifully carved chairs with green satin cushions. There were also many plants placed on the floor or on wooden shelves, some of which Nia had never seen before, and on the floor lay something that looked like a giant blue pillow. All furniture was arranged in a way that it fit the round room perfectly. Prince Lir had emerged from behind the red curtains of the canopy bed. He had seen Dwyn's bloodstained tunic and hurried towards him, horrified. "Don't worry Lir, I'm fine! What are you doing here?" Lir looked confused as he was trying to process everything. "I uh... I came looking for you when you didn't attend tonight's big reception for the Royal Assembly. And when I found your room empty, I decided to wait for you. I was worried after... after everything that happened!" He shook his head. "But I still don't understand, you're covered in blood!" "I'm fine Lir!” he said and nodded his head towards Nia. “...she healed me!" Lir glanced at her in surprise as if he had just noticed her. "It's you!" he breathed. He looked even more confused. "Dwyn... what happened?" Dwyn didn't answer and looked away. Lir must have sensed that something was wrong, and suddenly smiled. "But what am I thinking! You two must be exhausted. Come, sit down! Both of you!" He gestured towards the giant blue pillow on the floor. Nia gratefully accepted, happy to finally be able to rest a little. Ky was already lying on it, resting on her side when Nia sat down next to her brown and grey striped body. Dwyn took off his bloody tunic and walked to a tiny pond that had laid hidden behind a row of taller plants. He stepped in and started washing off the blood from his chest and the wound on his shoulder. Lir watched him attentively. "It seems that I owe you my thanks!" he finally said turning to Nia. "What's your name?" "Please Nia, tell me everything!" Nia started with the dark streets of Oslas, where Prince Lir and Dwyn had left her. She told him of her journey to the cave, the voices she had heard, and her searched and destroyed camp. She deliberately left out why she was camping near a forbidden tomb of the old kings, but Lir didn't seem to notice, or if he did, he didn't show it. He had sat down in a chair opposite of her and was listening closely. When she reached the part where the cloaked man had wounded Dwyn for the second time, there was a sudden scream and a breaking sound. Nia winced and turned around. She saw Dwyn on his knees in the pond, breathing heavily. A plant lay dispersed on the floor, its pot broken into several pieces. "Dwyn," Lir said calmly. He got up and walked over to him, reaching out his hand. Dwyn looked up at him. Nia could see the anger and sadness in his eyes. "It's alright. Come, let me help you out!" Dwyn reluctantly took his hand and got out of the pond, dripping with water. "You don't understand, Lir!" he whispered shaking. "It was him! The man who killed my father! And I couldn't avenge him! I couldn't defeat him!" He sunk back onto his knees, both hands touching the floor. Lir seemed taken aback for a second. "So it was no ordinary accident," Lir said quietly and more to himself. Dwyn pounded his fists onto the floor. "I WILL FIND HIM! AND IF IT'S THE LAST THING I'LL DO!" Lir lifted him back up. "Cousin! Listen to me! We will find him, I promise you! But you have to trust me! Do you trust me?" "Good! I want you to get some rest now!" His voice sounded strict, and he was looking him straight into the eyes. "Your body and mind have been through a lot today. You've lost too much blood and you need to rest!" He examined the wound on his shoulder. " ...and you need something to stop that bleeding." Dwyn nodded. Lir guided him over to the canopy bed. Then he took a white cloth out of a cabinet and dressed Dwyn's wound, covered him with a blanket, and closed the red curtains. Nia watched in awe. There was such a strong bond between the two of them that she couldn't help but feel sad. This was the kind of affection that she had always craved and had never gotten. She imagined herself being the one Lir would care for so attentively, but as soon as the thought crossed her mind she felt ashamed. Lir returned to the seat opposite of her and sat down. "What an unfortunate turn of events." His voice sounded sad. "I'm sorry you had to see this. He's very strong, but this was too much for him." "Yes." Nia was still trying to process all of Dwyn's emotions. He had been so cold to her earlier, but even his sudden outburst didn't explain to her what he was truly feeling. "Please, continue with your story." She told him how she couldn't watch Dwyn die, and how she had stupidly stepped between him and the cloaked man. How that man had held up a blue glowing stone, and how a light that was as bright as the sun had finally knocked her off her feet. Lir straightened up from his chair at her last words and stared at her in disbelief. "The light hit you in the chest?" "Yes! I was pushed backwards and hit my head, and then everything went black!" "Now that is interesting!" He got up and started to pace the room. "So you're saying that he tried to kill you with the crystal, but didn't succeed?" "And then? How did you get the crystal?" "What?" He abruptly stopped his pacing and stared at her. "But how... how were you able to heal Dwyn then?" Nia looked down at her fingers. "I don't really understand it myself either.… All I know is that my hands started to glow when I touched his wound... and I felt some strange warmth in them." Lir knelt down in front of her and took her hands in his. He started examining them, but he didn't seem to find anything out of the ordinary. He looked up at her with his grey-blue eyes. A strand of long blond hair had loosened from his ponytail and was framing his face. "So that man got away with the crystal?" "But you were still able to perform magic on Dwyn!" He stood back up. "I don't understand! How can this be? Unless…." He quickly turned around and looked at her astonished. "It's in you!" "The crystal! That man may have unwillingly transferred the crystal's power to you!" "...the crystal's power... to me?" Nia looked at him baffled as he knelt down in front of her and looked her straight in the eyes. "Listen, whoever was behind this definitely didn't plan this. And now, instead of having to find the crystal and get it back, we are one step ahead of him! Because we have you, and the power of the crystal within you!" Nia shook her head. This couldn't possibly be the truth. "I know this is a lot to take in right now," Lir continued, "but I promise you everything will make sense to you soon. Maybe you should get some rest! And when you wake up things will look different." He smiled at her. "There should be some blankets for you right over there." He walked to the nearest wooden cabinet and took out a big blue blanket. Nia laid down next to Ky who, rolled up, was already sleeping peacefully. Lir covered her with the blanket and Nia smiled. Then she fell into a deep sleep.